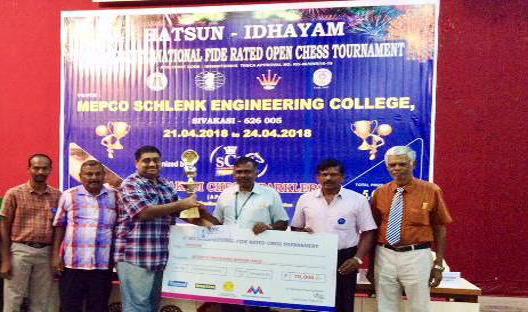 The fourth edition of the Hatsun – Idhayam SCS FIDE Rated Chess Tournament was organised by Sivakasi Chess Sparklers at the Mepco Schlenk Engineering College Sivakasi. Two hundred and eighty seven participants, mostly from Tamil Nadu besides Karnataka, Kerala, Railways, BSNL and Pudhucherry took part in the 8 round Swiss league event. The time control was 90 minutes to each player with an increment of 30 seconds per move. 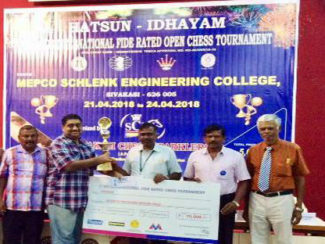 Grandmaster R R Laxman of ICF had the privilege of heading the ranking list, followed by International master P Shyaamnikhil also of ICF, A L Muthaiah and International master V A V Rajesh of Tamil Nadu. 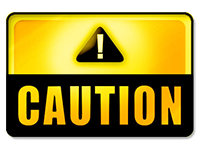 Results were on expected lines in the first two rounds, with higher rated players outwitting their weaker opponents. In the third round, eleventh seeded International arbiter S Ganesh Babu of Madurai was held to a draw by unheralded Nithish Muthukumaran. In the fourth round, seventh seeded former national Rapid champion Ram S Krishnan of BSNL drew with M Dinesh Rajan of Karaikudi and S Prasanna of Chennai lost to lower rated S Suganthan of Tirunelveli. Four players – R R Laxman, Rajesh V A V, IM elect Kunal and OT Anil Kumar of Kerala who upset IM B T Muralikrishnan of Railways led the field with five points each at the end of the fifth round. The encounter between Laxman and Kunal ended without any decisive result on the top board of the sixth round and same was the result on the second board between OT Anil Kumar of Kerala and VAV Rajesh. IM Shyaam Nikhil and AL Muthaiah joined the above four players in the lead with 5.5 points by beating IA S Ganesh Babu of Madurai and Sa Kannan of Karaikudi. The number of players in the lead was reduced to the top three seeds – Laxman, Shyaam and Muthaiah, as they registered wins over IM Rajesh, OT Anil Kumar and Kunal respectively in the penultimate seventh round. The final round, Laxman quickly settled for a draw and Muthaiah followed them out of the hall by splitting the point with Hrithickkesh Pr of Neyveli paving for a three way tie for the first three places with 7 points each. When tie-breaks were applied, Laxman emerged winner, followed by Muthaiah and Shyaamnikhil. Laxman received Rs.70, 000/-, Muthaiah collected Rs.50,000/- and Rs.35,000/- were awarded to Shyaam. Dr. S, Arivazhagan, Principal, MepcoSchlenk Engineering College was the chief guest for the inauguration as well as prize distribution function. A booklet with a compilation of several enjoyable games annotated by the leading players like VishyAnand, Magnus Carlsen, Bobby Fischer, Garry Kasparov and other stars was presented to all the players.